Q. When I'm riding with my friends, they usually beat me to the top of the hills. Can I swap out the gears on my bike to make it easier to climb? The answer is a qualified "yes." There are different ways to install easier gears on your bike, but it's not always a matter of swapping just the gears. Depending on the type of components that you already have, and the compatibility of those components, you may need to replace some of other components. Your chainrings are the set of (usually 2 or 3) gears closer to the front of your bike, attached to your crank arms and pedals. Smaller-diameter chainrings (or in other words, those with fewer teeth) correspond to easier pedaling; larger chaingrings mean harder pedaling. Road racing bikes typically have 2 chainrings, with a 52-tooth big chainring and a 39-tooth small chainring. This is what we sometimes refer to as a "standard double." The easiest way to get lower gears with this setup is to convert your entire crankset to a "compact double," which has a 50-tooth big ring and a 34-tooth small ring. You'll likely have to replace your whole crankset and chainrings, rather than replace the individual chainrings only, because the arrangement of the bolts that attach the chainrings to the crank arms is different for the two different chainring size ranges. In most cases, if your bike is relatively new, you won't have to replace your front derailer when converting from a standard double to a compact double. Most modern front derailers are cross-compatible with both types of cranksets, but if it's an older model, it may need to be swapped out as well. The compact double configuration has become very common and popular on recreational road bikes, because you get the advantages of a two-chainring setup (lower weight and simplicity of operation), with almost as low of a gear range as a three-chainring setup. You do lose a couple of gears on the higher end, but unless you're a serious racer, most average riders don't miss those top gears. Road bikes with 3 chainrings are typically in the range of 52-42-30 or similar. This provides quite a wide range of high and low gears, but if you feel you need something lower, you can swap the crankset out for a "hybrid" or "touring" crankset, which usually have chainring configurations of 48-38-28 or 48-36-26. If you've already got a front derailer that's compatible with triple chainrings, then it's likely it will still work, but it's best to check with your mechanic to make sure. What about switching to a mountain bike crankset? These usually have 44-32-22 chainrings. The problem is that you'd need to switch to a mountain bike front derailer, which also means switching to a mountain bike shifter. If you've got drop handlebars, a mountain bike shifter that works with all of this does not exist, unless you'd be willing to switch to a bar-end type friction shifter. Besides, most people, even casual riders, find that mountain bike gearing is way too low, and you'd have trouble keeping up with your friends on the flats and downhills because you wouldn't have high enough gears! In some cases, it might be possible to just swap individual chainrings on a triple setup. This way, you might be able to just swap your smallest chainring to have a lower "granny gear" when you need it. You'll need to worry about the bolt pattern issue mentioned above, plus front and rear derailer compatibility issues, which can get sort of complicated, so again, it's best to talk to your mechanic to see what options are available to you. Your "cassette" is the set of gears on your rear wheel. Some older or cheaper bikes may have a "freewheel" instead of a cassette, but for the purposes of this discussion, the concepts are the same, so we'll only use the term "cassette" to keep things simple. The individual gears on the cassette are referred to as "cogs." On your rear wheel, the gear ratios work out the opposite of on your chainrings. In other words, smaller cogs (fewer teeth) on the rear correspond to you harder pedaling, and bigger cogs (more teeth) correspond to the easier pedaling. Most road bikes have either an 11-tooth or 12-tooth smallest cog, and a largest cog with 23, 25, 26 teeth. Cassettes (and freewheels) come as a complete set; in most cases, it's not possible to swap individual cogs; you have to replace the entire cassette. To explain how you can get easier gears by swapping cassettes on your road bike, we'll have to delve into some of the technicalities of how rear derailers work. Your bike comes equipped with a chain that is long enough to be able to wrap around your largest cog and your largest chainring at the same time. As you shift into smaller cogs and/or chainrings, it's the job of the rear derailer to take up that extra "slack" in the chain. How much slack they can handle depends on the length of the "cage," which is the part of the rear derailer that hangs down towards the ground. Road bike rear derailers often come in "short-cage" and "medium-cage" varieties. Most short-cage rear derailers can handle no larger than a 27-tooth cog, although in some cases, they can be made to work with a 28-tooth. If you have a medium-cage rear derailer, you can go up to a 30-tooth cog. It is possible to use a mountain bike cassette with an even lower range on a road bike, but you'll have to switch to a mountain bike rear derailer. Most mountain bike rear derailers have a long cage, which can handle a 34-tooth cog, or even some newer cassettes with 36-tooth cogs. The good news is that as long as you're using a cassette with 9 speeds or less, this will work fine, even with a road bike shifter. However, on the newer 10-speed cassette systems, mountain and road rear shifters and derailers are NOT interchangeable, so in most cases, you'll have to live with a maximum of the 30-tooth cog on your rear cassette. Most hybrid bikes come with a gear configuration that you might refer to as a "hybrid," appropriately enough. They use mountain bike shifters and derailers, a mountain bike cassette (usually 11-32 or 11-34 range), and a touring (28-28-48) crankset. So, if you've got an 11-32 cassette on your hybrid bike, and you want to swap it to an 11-34 to get you little bit of extra "oomph" for climbing, it's an easy cassette upgrade. Many road touring bikes, such as the Surly Long Haul Trucker, also come with a "mixed" drive train. They'll have road bike shifters, a touring crankset, road bike front derailer, a mountain bike cassette and a mountain bike rear derailer. This gives a nice, broad gear range that works well for cruising fast on flat roads, but also with very low gears for hauling your heavy touring load up a mountain. There may be other configurations and gear/shifter/derailer combinations that will work and meet your needs that are not outlined above. Your best bet is to bring your bike in and let us check it out and see what will work for you. One caveat that should be mentioned, however, gets back to the original question mentioned at the beginning of this article. Putting lower gears on your bike will make it easier to climb hills. But, note that easier is not necessarily the same thing as faster. In fact, in all likelihood, if your friends are getting up hills faster than you are now, if you put easier gears on your bike, they will beat you even worse. It's an unavoidable consequence of physics: easier gears equals slower speed. thanks for the science behind the whole bike mechanism of gears, but I have a question- is there not a single gear one can use to speed faster up hill..and also on a flat surface? like a one size fits all? I ride a fixie bike with front wheel 26" and rear 24 inches..number of teeth front 44 and rear is 22..so, could you best advice me with the best possible combination for really fast top speed on a flat and on mountain incline for a fixie. what if i changed front sprocket to a 32 or 34 or 36 teeth? would be grateful for your kind advice. 46x18 ie 69 inches. Your gear (if you really have a 24 inch back wheel) is crazy low at 48 inches unless you are riding off-road. If you are road cycling in undulating country I would try an 18t cog. BTW to calculate a gear in inches multiply the wheel size by the chainring teeth and divide by the cog teeth. You will see that 48x18 gives exactly the same size gear as 32x12, for example. Jaideep, if you're riding a fixie, then you're on your own. There is no perfect "happy medium" gear for both speed on flats and climbing up hills. The lower you go in your gear for easier climbing, the more that hurts you on the flats, and vice-versa. great article, I have been looking for this description for a long time and this explains what I need perfectly. thanks for the knowledge, was very helpful in modifying my velo ! thanks, but I still would like to have your views...if i bought another bike for road..a 29 inch wheel one..made the rear 26 inch..and added front crank with 52 teeth, rear cog with 22 how fast would it run on road? and for easy mountain climbing, made my ss speed bike front crank 36 and rear 22? or should it be, front 32 and rear 26? do please give it a shot..two bikes, different road travelling conditions. It would be impossible for me to say how fast you could go, because that depends not only on the gears, but on how fast and hard you can pedal, and I don't know you or how fit you are. From my personal experience, I find that a good gear for on-road use (with 700C wheels) is 46 on front, 16 on back, and that's sufficient to go reasonably fast on flats, but low enough to crank up any hill (however slow or fast). For off-road use, with 26-inch wheels, a 32x18 is generally accepted to work pretty well for all conditions, and for 29-inch wheels, a 33x20. 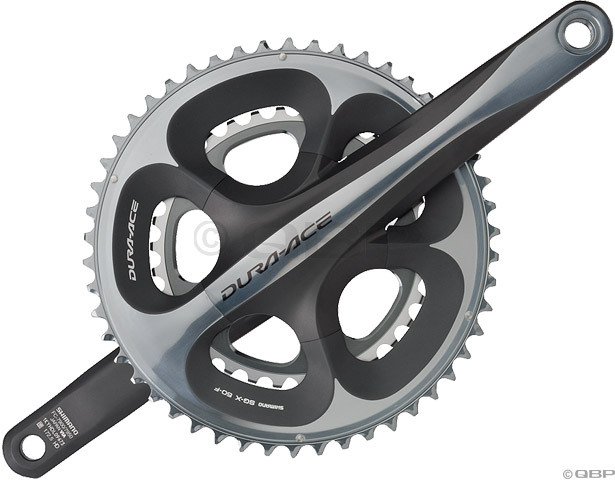 I have a road bike with 53/39 crankset, 11-28 dura ace cassette, and thinking about changing to compact crankset and switching cassette to a 11-32 or 11-36 Shimano Deore XT, to ease climbing capabilities. any thoughts or suggestions? Alexander, that is probably do-able. How many gears are on your cassette; is it 9-speed, 10-speed, or 11-speed? We'd probably want to look at using an 11-32 or 11-34 cassette. 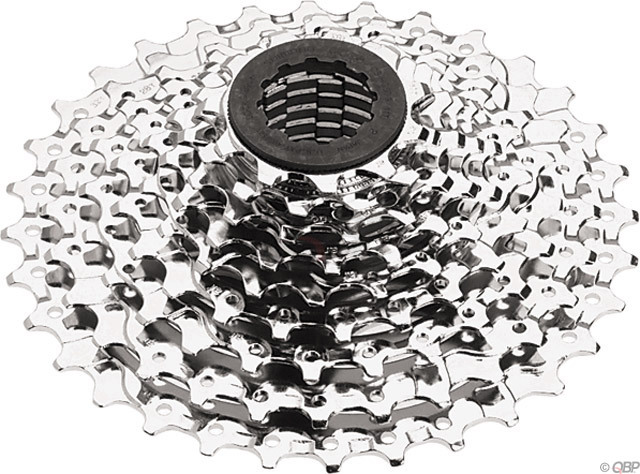 The 11-36 cassette is not recommended unless you have a hub specifically designed to handle it, because of the additional torque that the low 36-tooth cog can put on your freehub body. It is ridiculous to say that easier gears won't enable you to get up a hill faster. Being limited to the easiest gear of a standard road bike takes a devastating toll on a rider if they engage in real climbs. I've hit 18% grades on my standard geared road bike, and one single revolution takes at least 90% of my full effort. This sort of "grinding" resembles weight lifting, not an endurance sport. As such, your blood sugar is crushed (like someone who rides at too low of a cadence generally), your knees are damaged, and your ability to even make it up a sustained climb (let alone do it quickly) is greatly impeded. Crushing yourself with an unnecessarily hard gear during the steepest grades ruins the entire climb. Calm down, James. We didn't say that easier gears WON'T make you get up the hill faster, just that if you use easier gears, you'll have to pedal that much faster if you want to go faster. Of course we're not advocating grinding in high gears; that was the whole point of this article. The point of the passage that you're referring to was that if you use easier gears, you'll have to pedal that much faster in order to go faster. I currently ride a 53/39 w/12-27. Even with that cassette I slowly grind up hills in the 39/27. It's frustrating because I'm in decent shape otherwise: 5.11, 198lbs, lift weights and athletic, but I just got into cycling 3 years ago and figure it may take some time for me to get in "bike shape". I can keep a 18-20 pace solo and am comfortable in 24-26mph pacelines. However, I know I'm not pedaling at 90rpm as I tend to be a grinder, and get killed on steep hills. Would the 50/11 gear still FEEL easier to pedal (thereby giving the rider the chance to still pedal at a high rpm) compared to the 53/12? Or will it, in fact, still be harder to pedal because it's a taller gear period? Thanks in advance for any additional insight. Mike, you are correct in that the 50/11 combination is a higher gear than the 53/12. Where you gain is the easier gears on the low end with the 34-tooth chainring. Personally, what I found when I first switched to a compact crankset is that I was having to switch between the small and big chainrings more often compared to a standard crankset. But once I got to it, I thought the compact was a good thing. I suggest that the best way for you to find out how it feels is to try it. Most of the new road bikes that we have in stock come with a compact crankset, and you're welcome to take them for a test ride. If you're looking to go up some hills, the Peninsula store would be the best place, as being down in the Cuyahoga Valley, you have to go uphill just about any direction you leave from the store. I have a Dura-ace 12-27 9 cog cassette. I can't find any mechanic in Spain with enough know-how to maximise the number as I am an old timer and want to spin more on hills. Any idea what the max cassette would be without new cage. Would I need to modify change? THANKS Great article..best on the web! Chris, with a Dura-Ace rear derailer, 27 is probably the biggest cog you can get to work, although you might be able to get away with a 28. Fortunately, since you're talking 9-speed, your shifters are interoperable with 9-speed Shimano mountain derailers. 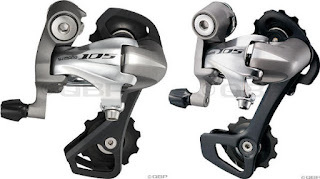 You can still get an XT 9-speed rear derailer (M772), and that would work with up to a 36-tooth cog. I don't understand your question "what is the rotation." What are you asking? How different will it be when I go from a 53-39 (front) and 12-29 (rear) to a 50x34 (front) and a 11x27 (rear) compact? My ? is based on using two different bikes; not switching cranks and/or cassettes. I have a Speciallized Sirrus Pro ( hybrid bike ) with one chainring ( 40 ) and a Cassete 42-11. I would like to know if it is possible to mainten the cassete ( 42-11 ) and switch my chainring for one 52-39. Can i do this? No, an 11-42 cassette cannot be used in conjunction with a 52-39 crankset. I am a heavy rider and I am planning a few very hilly races this year. Would getting a 11-32 cassette help? should I change the cranckset too, to what? I am doing long distance triathlons and I need to have some easy gears to maintain a good rpm and not burn my legs on the bike course. Let me know and thanks in advance for your help. Xavier, depending on the model of your rear derailer, you may not be able to go as high as a 32-tooth cassette. Switching to a 50/34T crankset will help, though. You should take the bike to your local bike shop and let them help you choose the correct parts. Kevin, thanks for the info, if my rear derailer accepts the 32, would a 11-32 cassette and a 50/34t crankset be a good combination? Yes, that would make an excellent combination.